Samhain's a comin... the pumpkins getting carved! We had a visit from Grannie today, I braved the outside world and met her in our local wagamamas with the girls. In a bid to stop Phoebe having the screaming abdabs I allowed her to take Glenda Rabbit in the toy Pushchair... never again, may I take this opportunity to publicly apologise for any ankle damage done today by Miss Phoebe. 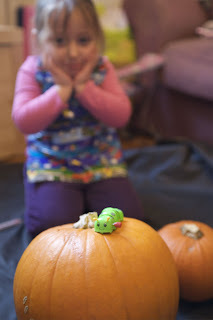 We all stuffed our faces on delicious noodles and chicken and rice and duck gyoza and edamame and then we decided to pop over the road to Waitrose to get some Pumpkins for carving. They picked their own, Phoebe picked a little one and Clara picked the biggest one she could see. Clara then insisted on walking home so we buckled the pumpkins in the to the pushchair for safe keeping and scored a few odd looks! Not bad at all I thought! We surprised Daddy with them when he got home and he was suitably impressed with my efforts. I may even find it in my heart to forgive him for eating the stash of Iced Gems he got from a child's party yesterday without offering me a single one (and then to add insult to injury offering me the last one that was without the iced bit.... bah!). She looks SO cute! I have pink leggins for her to wear on the day and I am quite taken with this top for underneath! The girls seem to be a fan of Method Acting and have been chasing each other around the house all morning to get into character. Although I did have to point out that it is usually the cat who plays with the ball of wool (bought to make pompoms) and not the mouse! Whilst they were here I had a few things to do like making bread and a Piñata for the Halloween party next week. As I do my dough in a breadmaker (small children + messy ingredients + no patience = breadmaker for first step) I had to knock back the dough and make a loaf so I got the 3 girls involved and they made hedgehog bread rolls (Ok so Phoebe was difficult and wanted to make a penguin...). They lined the 3 little chairs up against the counter and got stuck in with their dough and had a marvellous time kneading and shaping (I use the term loosely) their hedgehogs before putting them down for a snooze on the baking tray to prove. We even got told off by Eliza for talking to loud as the hedgehogs (and penguin) were trying to sleep! Whilst we waited for them to prove I made up some wall paper paste, we put a mat down on the living room floor and started on the next layers of the Pinata. Phoebe, Clara and I had already done one layer of thick white paper to start it off. Today we did lots of layers of newspaper. Remarkably (especially given Clara's tendancy towards mess of the highest order) it was a remarkably calm and un messy affair. We think it is because they had something to focus on. 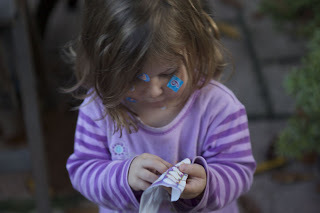 I would also confess to them getting a bit bored after a while and Annabel and I reclaiming our youth and bulking out the layers, well if you can't use your children as an excuse to do silly things when can you?! I just need to finish it off with some kitchen towel to give it a nice white finish so that it paints easily. Once the piñata was done I shoved the bread in the oven and once it was baked the children ate their rolls as snacks! I should also add that whilst all this was going on Hugo was merrily playing with magnets and watching. We weren't leaving him out he is just a wee bit too young to get fully stuck in with wall paper paste we thought (that song "When Father Painted the Parlour" comes to mind when considering any 1 year old, two ice cream tubs of wallpaper paste and a shed load of ripped up newspaper!). The plan with the piñata is to paint it on Thursday whilst we have a Mummy-needs-to-survive-halfterm party. I think mat down again and a shed load of orange paint and a load of brushes and hope the kids all stay focused on the large round papier-mache thing and don't get distracted by, oh I don't know, the lovely blank walls lol! I am also planning on making biscuit dough in advance and let them loose with the cutters. I will probably also shove some bread dough in to brew as that went down so well today and is so much fun for them, it really is nearly impossible to muck up bread making! it was necessary to wash them after starting on our papier mache Pumpkin Piñata... then I just left them to it, well I have to mop later anyway lol! This morning as both girls were at preschool I got down to work and made Mum's birthday gift (would show pics but she reads this blog!) and I finished Phoebe's Samhain outfit. She is delighted and better yet I was spared having to make the ears as Mybecky came to the rescue and dug some out of her girls' dressing up box! It was simple enough to do, I got a black polo neck jumper from Tesco, trimmed the arms and sewed a thumb hole in, then I used a blanket I had to cut out a white tummy. The tag is just cardboard covered in tinfoil (I may also add a bell). For the tail I took a pair of leggins we had about the house that are too small for Phoebe and had a hole in so I cut one leg off (leaving the waist band intact) and sewed the other up (smaller than a whole leg) and stuffed it (I am now being informed that it needs some white on the end too but she can whistle for that as it means handsewing and is a PITA). I have promised she can have violet nails on Samhain for the party and I will do her nose and whiskers with my eyeliner! 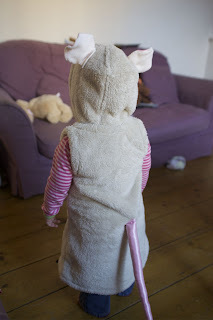 Now I have to do Clara's Mouse outfit but I need to send Paul on a mission to go and find a cheap grey hooded jumper dress (or just jumper) and some baby pink leggings, any ideas?. We also need some black plimsolls for Phoebe. So Proud Of My Big Girl! Phoebe is very much a 0 - 100 % kind of girl. She stores all the information she learns until she suddenly just gets it. It was like this with crawling, walking, swimming & her speech! Anyway, today I got to preschool and Mybecky (as named by Phoebe) called me over to see her, normally as it is a Clara day this isn't a good thing (glue eating, wall decorating, other child decorating...) however I was presented with the above! 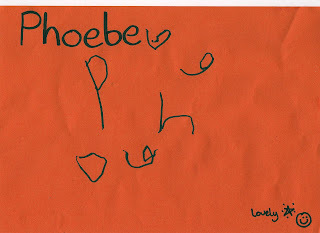 My girl wrote her name :D. She actually did it twice but the better version went in her folder, she is sooo proud of herself! She also drew a fab picture of her family, all with smiley faces. Clara isn't doing too badly either, she can already draw a C and is working on the rest. Not to mention she spelled her sisters name in the pool yesterday whilst we were trying to swim! Oh and she hasn't tried to kill herself in a while which is always a welcome change! I am still trying to teach her to shout Banzaaaaaaaaaaai before she does anything silly but what is silly to us (like jumping off things, balancing on things etc) isn't silly to a 2yr old with no fear I think! I love this time of year with Halloween approaching (ok so I could do without the dark nights and cold weather but I like the feeling). This year we are going to our lovely friends (and Clara's Oddparents) Jane and Mike for Halloween as they are doing a small party and fireworks so it should be ace. Jane has also, uncharacteristically, lifted her party control (I am just as bad hence allowed to tease!) so I am making livid green marshmallow (if I can figure out how too I may put some raspberry sauce or similar inside them), pumpkin shaped biscuits and a pumpkin pinata. At least it will keep me busy and out of trouble next week and the girls busy during half term. 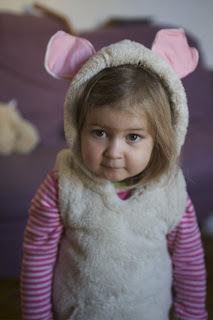 I have to think about costumes for them too, now I could attempt Asda or similar for ready mades but, well, I think we all know that isn't going to happen now is it. So now I have to decide what the two small ones will go as. I am quite liking the idea of Clara as a spider but then I think she is clumsy in general anyway so add in an extra 4 arms and she could reach new heights of destruction. I wonder if I could make a Ninja costume for her as Mike calls her a Stealth Ninja as she seems to get precisely what she wants but no one is ever sure of how she has done it! Phoebe should have a say now really but she is refusing to decide, I quite fancied making her a Bat but bats are too scary apparently [long suffering look]. We will have to see what we can manage next week. The temptation to smear her legs with yellow mustard, pour cottage cheese over her shoulder, shove one of her dollies in a sling another in the pushchair and send her as a Mummy is almost too much though! Of course Halloween isn't just about scaring children and playing silly games to us. It is a Pagan Sabbat, we call Samhain (Soween). It is the pagan new year and festival of the dead. At home we lay an extra place setting at dinner so we can share our meal with our beloved departed. When the girls are older I am going to make a photo album of all the loved ones who have passed on so we can sit and look through it and make time to remember them. 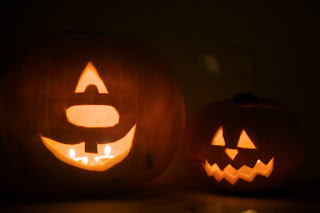 My personal take on it will be that we remember them all year round but the veil between them and us is thinner on Samhain and they enjoy our remembrances and games. We consider it new year as it is when Nature starts again. The crops have been harvested and the earth rests (at least this is my take on it). For me the over riding theme is that the end of something is the beginning of something else. I hope this year it works for me too, traditionally for me November is a 'king awful month and in my current state I am not sure if I am going to cope too well with any more major set backs / bad luck. Still I am feeling more positive every day and the Diazepem (short term only) is helping with the panic and anxiety (mind you I think Paul is using it's affects to his advantage, was it intentional to take me tv shopping just after my taking one? Who knows but we now have a lovely wall mounted LCD TV lol) and hopefully the citalopram will kick in soon too and things will continue looking up for a while. Gah!!! I have a stuffed toy sewing block! I tried a Black Apple Doll : FAIL! Then I tried a Bunny: FAIL! Gah! What am I doing wrong?! It is most infuriating, I just want to make some cute cuddlies as Christmas Gifts for the babies I know. I suspect with the bunny I should have sewed it together and then cut the fabric out around the stitches (I was trying to make it at night so the girls didn't bother me). I will unpick the bunny and give it another go later and hopefully achieve a pass grade this time. You may have noticed things have been a bit tough recently. I haven't been coping well with anything, this includes a massive (and I mean gargantuan) panic attack that lasted pretty much overnight. Thanks to 3 very close friends, my lovely husband and my wonderful parents I came through the other side. I was able to calm down enough to pop and see my wonderful friend yesterday afternoon where we went through everything that was happening at the moment and she helped me sort it all out in my head a little better. She also helped me to see that some of the things I have done (like the facebook stuff) was because I was not feeling rational and could only see one way of doing things, the only thing I know how to do which is to withdraw myself. It doesn't make the greatest of sense to anyone really, well anyone except me but it is the only method I have for coping with things and protecting myself. It was also my way of not getting others involved although I appreciate it didn't work quite the way I intended it to. This morning, whilst the girls were living it up at pre school, Paul and I headed off to the doctor. Until now I have done this on my own, doctors appts I mean, but we both felt I have a distinct knack of shrugging off the harsh reality of things sometimes and Paul was much more able to give an objective and truthful view of what has been happening of late. Between the 3 of us we figured out that the dosage I was on was controlling the depression side but wasn't enough for the anxiety I have been feeling which has been pretty out of control this year. It was getting to a hindering point where I don't like leaving the house if I can avoid it. Especially on my own or with just the girls. I am usually ok if I am meeting someone as I know I am safe and have a 2nd person there to stabilise me (whether they are aware or not) or keep an eye on the girls with me. On my own, with the girls or even if I am meeting a large group of people I feel open and vulnerable and, sometimes, terrified. In fact the last time I met up with a group people I ran late because it was scaring me being out and about alone in a city I didn't know (one of my big fears is getting lost, I am a true Tomtom addict! ), I think they took my slow strolling as enjoying being out without the girls when it was in fact me fighting every step of the way to get there and not high tail it back to my car and come home. When it takes you all day to have to work up to going out for a bag of stuffing or to the post office, it is not right. Anyway so now I have calming meds for a bit to take the edge off my anxiety and a higher dose of anti depressants. Next step if this doesn't work will be a different kind of AD. I have already had CBT (Cognitive Behavioural Therapy) at the start of the year, that really helped for my BDD (Body Dysmorphic Disorder) issues but hasn't really helped for the anxiety which is why we are seeking more help. The change that has happened for the positive is that I am not feeling the pressure to be well anymore. This is a difficult thing to describe, I often feel pressure to get better for the girls, or for Paul or, well, anyone else but me. I think that until recently I haven't 100% wanted to get better just for me but for everyone else so they wouldn't have to put up with me like I am anymore. I am acutely aware of how frustrating it must be when they can't see the stumbling blocks and why I can't just go to the doctors or even pick up the phone and call someone. In my darkest moments I can see only two options which were a, get better or b, suicide. Both seemed such an impossibly huge task with enormous repercussions I preferred the limbo of doing nothing. However the support I have had over the last few days has somehow changed my perspective. Knowing that people are there to just hold my hand if I need them too and help me sort through the mess that happens in my head. I know they have always been there for that but I never believed it until the last couple of days really. Anyway, there ends the waffle from me. I hope I have not upset or offended anyone this time (I have a small case of The Fear that I will do that again). I am now going to go and hang up my car keys for a week and take my first dose of the new meds [gulp]. I've cocked up and I apologise. I have deleted my rant post. If I have offended I apologise unreservedly. I am hurt, upset and have only a couple of places where I can vent myself. I honestly don't understand how everything has come to this Chez Moi, I spend all day wondering if it is me. Do I deserve to be here, do I deserve to breathe this oxygen. How can I when I seem to hurt people and upset them without intending to. If I could turn back time and not be ill or just have remembered to send that sodding email I would. However I can't and it seemed like everything has been slipping away from me since then. I know I make no sense, I wish I understood my thoughts and feelings somehow. It would make everything so less dark in my head. If I had the courage to disappear I would but I don't. Instead I cocked up and acted rashly because I didn't know who I could trust. I was wrong. Please don't think this is passive aggressive or anything untoward, it isn't. It is just one confused, hurt and sad woman's utterings because I have no where else to write it. Can I ask a favour of you please? Could you possibly send all the good vibes and prayers you can muster to a lovely lady and her family for me? Her name is Shaina, she lives in America, she is a fabulous blogger, crafter and bag maker extraordinare, Mum of 4 gorgeous children and is expecting her 5th. Baby 5 has a heart defect and, as she found out yesterday, a cleft lip. Her little baby boy will have to undergo surgeries to correct his lip and heart and, naturally, she and her family are very worried and stressed by it all. So if you could send all the good wishes, vibes, prayers, love and luck you can muster her way I would be most grateful. There is nothing as satisfying as a homegrown, home cooked meal! Whilst preparing the parsnips line a tin with some foil, put the olive oil in and pop in the oven to heat up (190 degrees C). Steam the parsnips for about 6 mins until they are soft then put them in the hot olive oil and shuggle (technical term) to coat them. Roast them for 15 minutes and the take them out, put the syrup on, shuggle again and pop them back in the oven for 10 minutes. In a large pan fry the onion and garlic in the butter. When they are soft add the flour and cook for a minute. Then slowly add the stock (as if you were making a white sauce). When the parsnips are ready carefully pour them and the juices into the stock, bring to the boil and simmer for 10 mins. Whizz until completely smooth then stir in the double cream and serve. Ha! The truth will out! Phoebe: Noooooo, I like to whinging! I spent yesterday afternoon with my lovely friend Annabel and, for the first time in our friendship, we left the children with the husbands (with instructions on how best to deal with a Phoebe vs Eliza squabble, they have a bit of a love / hate relationship lol) and headed off to the nirvana that is Annabel's local haberdasher. We were so enamoured with not having to permeate every sentence with "no" or "put it back" or "Phoebe don't be wet" or to hear the "I'm hungry", "I'm thirsty" or "I need a wee". It was as hedonistic as two thirty something Mums with small children and a craft habit get! Anyway the haberdashers was fab, a treasure trove of lovely things for making even lovelier things! I had gone in on a mission as I had my eye on making a Margaret Bag for myself (purely selfless as a test run [cough]). The haberdasher was lovely and really helped this dimwitted novice out. I found these two lovely fabrics in the curtain section and we made a joint decision to eshew the interfacing and interlining [life on the edge or what?!] and just have the double layer. I have zero patience so as soon as the girls were in bed and the husband was fed I cracked on with cutting the pattern, then I couldn't leave it like that so I did the pleats and... and... and... well I finished at 1am. This did include having to sew it together 3 times as the first time I tried I got the strap in the wrong place and the outer the wrong way round. Second time I got the straps on the outside again and the third time was the charm! Still it is soooo worth it and is very very beautiful if I do say so myself! Big thanks to Oh Fransson for the pattern :D.
So, I appear to be having a midlife crisis. 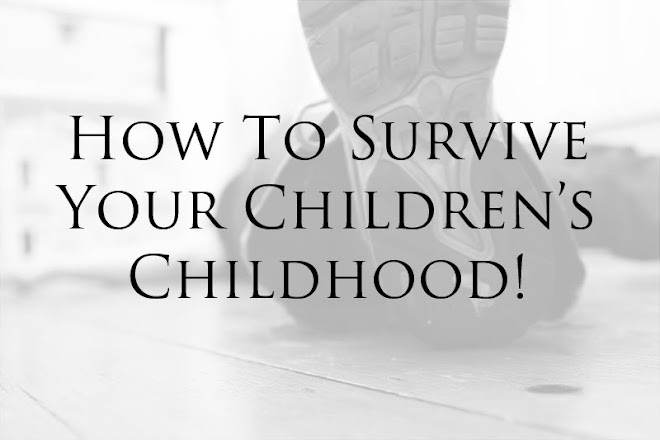 I am only 31, how did I manage it this early?! 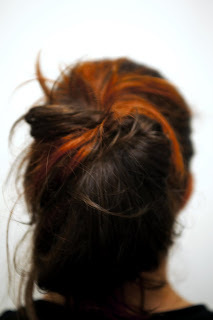 My hair is now 50% red and 50% chocolate brown (red underneath...) and looks farking cool. My nails are violet (they match my lovely purple crocs!). Clothes wise is still the same old same old top, jeans and flowy cardigan (fantastic item that my lovely step mummy bought) but I am finding the need to look up lovely long flowy black ankle length skirts and purple Doc Martens. I have also discovered that my black eye liner and mascara fall out of my make up bag and apply themselves to my eyes... I haven't worn make up for Non Events in eons! Paul is, naturally, jealous that I am having my crisis now. He wants his however I have informed him that as my MLC stretches to hair dye and a few minor new clothes and his will undoubtedly involve a motorbike of some description he can wait until we can afford it, harsh yet fair I think. "Mummy, you gonna have RED hair?!" "Can I have red hair too?!" I had to fib a bit and say that we weren't allowed to let little girls dye their hair until they were much bigger but once that day came I would help her do it what ever colour she wanted! She seemed pleased with this arrangement and gave up. I will stand by my word and help her to do it, well I wouldn't want a repeat of what happened on one of my first attempts. Picture the scene, there I was at some teen year, I forget which one, dyeing my hair in the little bathroom of my Mum and Sdads house when a globule splashes from my hair onto the carpet... whooops! However did my naive little mind worry about it on the carpet? Of course not, as it was of course fading dye in 6-8 weeks so that would happen with the carpet too no doubt. Erm, suffice it to say no it wouldn't and I was busted long before I could confirm this little theory. In my defence it was a very little bathroom.... and therefore a tiny carpet... and I was young... and innocent...and a bit dim. Seeing as I am let off mincemeat, Christmas pud and cake duty this year, we are going to France (and sorry burglars, the house will once more be watched carefully so mits off!) to stay with Grannie and Grande. I thought I should attempt a start on my Christmas gifts I have bought all the stuff I need to get started on my Christmas Tutu's for all the little girls we know... well most of them those that aren't getting tutus are getting something just as nice. I have sparkly tulle, ribbons and satin coming and then I will get started on my tutu production line :D. Amazing how in hindsight I can spend only a little over the amount of money I spent making 1 tutu to make 7! Wonders of Ebay I suppose! I am quite excited about it. 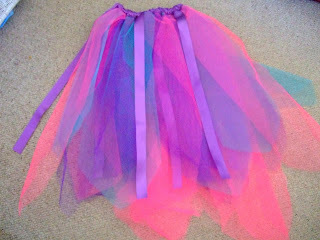 Especially as I know at least one of my tutus has been made by my lovely friend Annabel and looks fabulous! I have also been tweaking my wings tutorial, hopefully the new improved one will be even prettier than the wings I made for Dimitra. Watch this space for a new tutorial. I also have a dinosaur pattern up my sleeve that I will be working on once I have done the girly stuff, thankfully we only know one boy who needs a gift as I have a feeling this will be a lot more complicated than mucking about with Tulle! I need to find an outfit for minis too... or something. I might make a cuddly item for them, but something cool... will have a think! My baby will be starting Reception as of September 2010... Yeep! This morning I have been busying myself with calling the 2 non denominational schools in our area. I have a visiting date for one of them on the 30th November and I have to call back at the end of October for the other one. This doesn't sound too bad until you consider that the closing date for applications is 4th December! We are in an awkward position as, being pagan, a Christian school wouldn't be appropriate for the girls. However there are only two non denominational schools in our catchment area and both were over subscribed last year so I have a feeling I am going to worry about this from now until the 25th March 2010 when we can find out where Phoebe will be going. It is quite scary considering Phoebe at school. I worry that she will struggle there or won't make friends or won't keep up with the work. I know Phoebe so well, she is a 0-100% kind of girl and I don't know if that will work as well for her in school as it does at the moment. I also worry a lot about the friend thing, I have always struggled with that myself and was badly bullied in Secondary school (but it sort of started in primary too) and I really really can't say how much I worry that the same fate waits for my girls. I really hope not and I hope I will be able to help them as much as possible. It took some hard hunting through the cookbooks last night to find a stuffing recipe, Gary Rhodes Keeping It Simple wins the prize. I was surprised that there was only one stuffing recipe in [cough]94[/cough] cook books... obviously I don't have enough (Paul remains unconvinced of this!). Stuffing and Bread Sauce was done last night, just needs cooking / warming through. The gratin I will make shortly when I can pop up to the shop to get the double cream (and the other veg). The rest is plain sailing! The girls are very excited about seeing Grannie and Grande, I am hoping Clara will acquiesce to the request of a morning sleep (I doubt it but I can hope) and I am sure we will have a lovely afternoon. It is Grande's birthday on the 5th so they are bringing birthday cake for pudding, this will certainly put the girls in a good mood as they do love a good birthday cake! I loved our two weeks away with Dad and Jane but oh it is good to be home! We got in an hour earlier which was even better and the girls were delighted to see everything and the cat was pleased to see us too. Unfortunately it appears she had been sick whilst we were away so the laundry pile was rather larger than we anticipated! Still everything else is fabby and it is lovely to be in our own home again. I have taken all my pictures to Snappy Snaps for printing and have a sketch pad ready for making a simple scrapbook up tomorrow evening so that should keep me out of trouble for an evening. 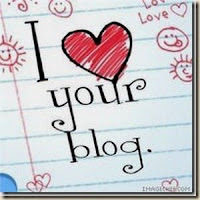 Last Greek Blog for 2009... sob! Well we have had 2 glorious weeks here with my Dad and Jane. The girls, for the most part, have been fabulous and well behaved. The cats, dogs chickens & seagull will recover with some good counselling and possibly valium... As for Dad and Jane, well they will stop rocking soon. Not for a while though they have Father Avraam's 3 month old Jack Russell cross bouncy puppy coming to stay for 8 days on Sunday. I have been saving the last of the animal pictures for this blog in the hope that Kenton and Brel will reappear however they are still AWOL and are being fed elsewhere. If they come back in the winter Dad and Jane have promised to photograph them for me so I can blog the miscreant kitties. Anywhere here are Maud and Wilfred. She has a glandular problem M'kay? And an attitude problem but we will skim over that. Poor Wilf, he just wants a friend. He has tried all the other cats to no avail and even the seagull isn't fussed. Now Paul and I face the Boat Trip, The Flight, The Train and The Taxi to get home with 2 small children who will be a, tired and b, missing their Papous and Yia Yia. Damn them for changing the rules on medised (not that I would drug my children... oooh no [whistles]. I am hoping the house is still in one piece (and one place...) and the cat is going to be too miffed with us for going and leaving her with the neighbours popping in daily. Only time will tell, I am looking forward to curling up in my bed tomorrow night though, and the girls sleeping through.